When you think of Japan, craft beer rarely comes to mind, yet there is a very strong and innovative craft beer scene going on in the Land of the Rising Sun. At the heart of this scene is Japan Beer Times, a bilingual publication that celebrates the Japanese brewing scene and allows readers to meet some of the influential brewers who reside both in Japan and stateside, further illustrating that while it is a big world, we’re all really just here for the beer. I recently had the opportunity to speak with their editor, Ry Beville, a craft beer fan and publisher who has called Japan home since 1997. When I first came across an issue of Japan Beer Times on a trip to Tokyo a few summers back, I was surprised to learn that there was such a strong craft beer scene growing in Japan. When did the Japanese craft beer scene really start expanding? Do you think it will continue to do so? Craft beer officially launched in Japan in 1994, with a change in tax laws that allowed for small-scale brewing. There was an immediate boom, but unfortunately, most of the beer was of really poor quality. It was seen as just a gimmick. The boom peaked around 1999, and then roughly 250 or so breweries began to go bankrupt. Throughout that time, however, there were still a handful of really good breweries making a name for themselves in Japan and at the World Beer Cup. Quality gradually improved and new breweries began opening. The turning point, I think, came about two years ago for a number of reasons. In major cities, public consciousness of craft beer began growing rapidly, as did the number of bars that were serving craft. Festivals also began growing in size and number, and local bar owners began to venture out to them to see what all the buzz was about. Imports from the U.S. entered the scene in a big way, too, thanks in part to Andrew Balmuth of Nagano Trading and Phred Kaufman of Ezo Beer. These imports excited consumers, drove sales at bars, and inspired domestic brewers. Finally, our magazine saw rapid expansion and I personally believe it has been important in spreading news and excitement about craft beer. At present we have some 40,000 readers. Many are saying that 2012 will be the year of craft beer in Japan, and I believe that. You see it spreading into more mainstream restaurants and bars, as well as traditional Japanese restaurants in places like Kyoto. That is where much of the future growth will be. Why was Japan Beer Times started initially? 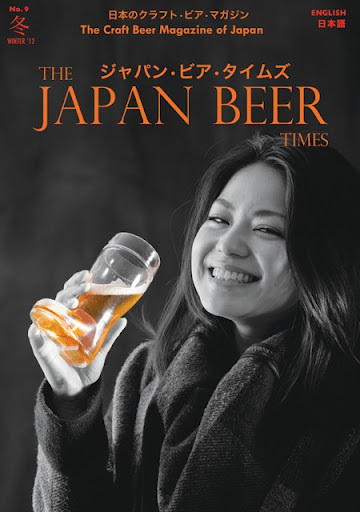 Are there many beer focused publications in Japan? I’ve been publishing a popular bilingual culture magazine, Koe Magazine, for many years. I’ve also been drinking craft beer since I first came to Japan in 1997. Well, Aoki Tatsuo of Popeye in Tokyo (a bar that now has 100 taps!) and several brewers encouraged me to launch a craft beer magazine, as none existed. This magazine would give me an opportunity to combine my personal passions and professional publishing skills. We were all really drunk when we were first talking about it, so I said, yeah, fine I’ll do it. Well, Aoki lined up a handful of other sponsors among breweries and bar owners and I went ahead and did it. It debuted at the Real Ale Festival in Tokyo in 2010, and was a huge hit. It has expanded dramatically since that time and is read throughout the country. I spent the first year after its publication traveling to craft beer bars and breweries all over Japan, to introduce myself and establish partnerships. I also traveled to all the major beer festivals and set up information tables so I could meet more people. I think that was important in its expansion as well, and is in the spirit of craft beer. At present, we are the only craft beer magazine, or even beer magazine, for that matter, in Japan. Other decent magazines, however, do run craft beer columns or occasional features and specials. I suspect we’ll see more of that this year, and perhaps a larger publishing company will try to put out a craft beer magazine, but I think that would have to be supported by corporate-level sponsorships unrelated to the craft beer industry. We’re a tightly knit community and I can’t see any of the bars or breweries advertising in a magazine run by a publishing house that really knows nothing about craft but just wants to capitalize on the scene. My first taste of Japanese craft beer was with Hitachino, as I believe they were one of the first small brewers to export. Since then, I’ve noticed more and more Japanese beers are appearing in specialty beer shops, from the likes of Baird, Coedo, Ginja Kogen, Yo Ho and others. Have you noticed that a lot more craft brewers are trying to get their products overseas much faster than they were before? The export game is a tricky one. First, craft breweries have to have export capacity, and few of them do. And if they do, then they had better be consistent in their brews or they’re going to meet with negative response and subsequent failure. That further winnows the list of those that can realistically export. I would say that less than a dozen should actually be thinking about it seriously at this point. More breweries want to export as a matter of pride and prestige, I think. And, of course, there is a lot more overseas interest in Japanese craft beer, so if some overseas importer wants Japanese craft for interested parties, why shouldn’t the two connect? I just don’t think this makes for any significant business; it’s more like a cultural and craft-beer exchange. Instead, I think small craft breweries should be more focused on claiming and saturating their local markets. Take Minoh, for example. They are located just outside Osaka. It is Japan’s second largest metropolis and yet there is no craft beer scene there to speak of (yet). Why would Minoh export (at smaller profit margins and greater risk) when they haven’t even begun to claim that big market in Osaka? I think if craft breweries focus on their local markets, they will grow much more quickly and reach a realistic capacity for exporting. Which brings another issue to the table: taxes. After breweries exceed a certain production capacity, they are placed in another tax bracket. The tax system against beer is rather punitive, and so for breweries to expand beyond that production-tax line, they really have to make a huge leap in production so as to not actually loose money to taxes. Well, when you suddenly produce a significantly greater amount of beer, what can you do with it? Export it. I think this is where we will see more Japanese breweries trying to export, but at present there are still only a handful that could make the leap, in terms of capital and production logistics, to much larger production capacity. What beer style do you consider to be the “definitive” Japanese craft beer? I’m not sure that this is a definitive craft beer style. In the early days, many breweries hired German brewers to train them, and you still see quite a few German-style beers coming from breweries. Some of them, like Shonan Beer and Tazawako Beer, make some truly excellent German-style brews. Also, we’re seeing more and more rice beers, which I guess you could call Japanese, but I haven’t found any of them to be truly remarkable. They’re quite drinkable, just not remarkable. Hitachino, Isekadoya and Swan Lake are all great breweries making rice beers. Most of the mainstream beers–Kirin, Sapporo, etc are lagers and that’s what people are most accustomed to. Maybe the lager is the definitive Japanese beer. Do you follow the American craft beer scene at all? Do you think that the beer styles that are really defining the new American movement (West Coast IPAs, Strong Imperial Stouts, Barrel aged everything) are influencing the beers that Japanese brewers are making? I do follow the American craft beer scene very closely, and am able to drink increasingly more of those beers here. I also run an article on one of the American breweries in each issue of Japan Beer Times because readers want to know more about these imports they are drinking. I’ve met many of those American brewers, and I’ll be meeting most of them again at the Brewers Association conference in April. I think the strong IPAs and other strong beers are having a significant impact on the styles of beers we see here. There was a definite IPA boom last year influenced by imports. And several brewers admit they are trying to imitate some of them. Nakanishi (of Isekadoya) made a spirited rendition of Ballast Point’s Tongue Buckler, and called it their Imperial Red. 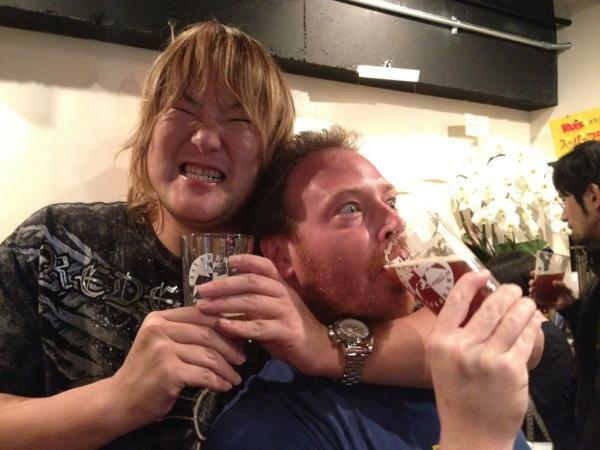 Suzuki of Bay Brewing Yokohama has been making some insanely hoppy beers based on American IPAs that he names after pro-wrestling moves: Dragon Splash, etc. There, I think you are seeing not only the flavor, but the fun spirit of American craft translating itself into the Japanese craft beer scene. Is sake more similar to wine or beer, and how has it affected Japanese beer-making culture? Sake is like wine in that it is fermented, but I think the process of making it is more akin to beer. For this reason, several noted sake breweries have transitioned fairly well to making excellent beer as well. Kiuchi (Hitachino Nest) is actually a very old sake brewery, and they still make excellent spirits! Iwatekura is another notable sake brewery that branched into craft beer. When the brewing laws changed in 1994, many of the first places to begin brewing craft beer were traditional sake breweries. While they understood sanitation very well, many of them didn’t understand beer, which is why so many of them went bust. But breweries like Kiuchi and Iwatekura have had many decades (if not centuries) to understand the process of process, so to speak. Sake has affected craft beer here, then, in that sake breweries that put time and energy into understanding beer typically make very good, consistently good, beers. Now, we’re seeing sake breweries that make craft beer looking at new ideas like aging craft in sake barrels. Hitachino does this. Shiga Kogen, as well, makes an excellent “Yamabushi” beer aged in oak barrels. I’d actually like to see more of this! That would be a distinctly Japanese style of beer. I read in a magazine recently that the beer tax in Japan is nearly 11 times higher than it is in the US, which in turn means that bar owners may need to charge as much as ¥1100 for a pint in order to make a profit on craft beer. Given the growing volume of small brewers (currently estimated to be around 150), do you see the potential for the taxes to be lowered to encourage more small business? Are there any groups that lobby for the cause of the small brewer? I know for certain that bar owners don’t need to charge ¥1100 to make a profit, not even for expensive American craft beer. Competition is driving prices down, and I think ¥800-900 is a very reasonable pint price for most domestic craft beer. Craft Beer Market in Tokyo sells pours of craft beer for ¥780 (though it’s slightly less than a standard pint). That said, taxes are unfairly high, I think, but I don’t think that’s going to change, either. Consumers are already paying that amount, so the government is unlikely to give up that tax revenue. If anything, taxes on beer could increase. There are not, to my knowledge, any groups that meaningfully lobby for the small breweries, and I don’t think the organizational power exists for that at present. What are your current favorite Japanese beers? What about American & European beers? You ask me a question that could get me in trouble as the publisher! But let me be honest: though my tastes may change from week to week, consistency is very important to me. Consistently high quality beers are my favorite. I think Baird Beer is perhaps the best brewery in Japan, with three gold medals at the last World Beer Cup to show for it as well. They make a wide range of fantastic seasonals and are always challenging themselves to higher standards. Swan Lake makes a world-class porter that I never tire of drinking. Shiga Kogen’s IPAs never disappoint. Hitachino Nest’s Espresso Stout is not overly popular in America I hear, but I love it, as well as their Extra High. And for an outside the box pick, I’d go with North Island, from Hokkaido. As for American beers, there are so many great ones available here that I drink regularly: Ballast Point, Maui Brewing, Bear Republic, Rogue, Southern Tier. I actually went to graduate school in Berkeley and lived not far from Triple Rock Brewery. They’ve been making some really great brews in the last year or so, and I always drop in when I go back to Berkeley for a visit. I know that Tokyo and the surrounding area has a lot of great craft beer bars. Can you recommend a few for our readers that may be traveling there in the future? Popeye in Ryogoku has by far the largest tap selection in the country, and the beers are in top condition. It can be a little pricey sometimes, but at least you can get a ten-beer sampler and try a lot. A new bar just opened in Shibuya recently called Good Beer Faucets; it’s very classy, with 40 taps and the manager Dede knows his beers well. Baird Beer runs two Taprooms in Tokyo, one in Harajuku, the other in Nakamegura, and I think they are both good choices. Incidentally, we are about to launch a craft beer app for iPhones called Craft Beer Japan that will allow users to find craft beer bars and brewpubs all across Japan! Each bar entry will have a basic review, so users can decide which place is best and closest to them. Many thanks to Ry for taking the time to answer our questions and fill us in on what is going on in the Japanese craft beer scene. Make sure you check out Japan Beer Times and even order one of their signature “Bad Beer is the Enemy” T-shirts. Also, if you are traveling to Japan any time soon, keep an eye out for their app, which will help you find the best spots to enjoy the finest ales that Japan has to offer. You can also follow both Japan Beer Times and Ry on Twitter. Posted in Beer Culture, Beer Industry, Travelogues.Tagged craft beer japan, Japanese beers, Japanese craft beer. A lot of really good info here, Jimmy; and the fact that there is a brewery in Japan making insanely hopping beers named after wrestling moves is heartwarming. Man, this makes me want to open an entire pro-wrestling themed brewery, and all of the beers are wrestling moves. Boston Crab IPA would be made with actual crab. What would the “Camel Clutch Amber” be made with? Do I want to know?? Very good overall picture of the current craft beer scene in Japan. There is, however, more going on in Osaka and Kansai region than the article would lead you to believe; not comparable to Tokyo, to be sure, but there are many breweries and beer bars and beer festivals. Look forward to the beer app. interesting! I find Japanese beer somewhat strange and mystical, probably as I don’t know much about it! Might pick up this book – thanks for the heads up!